Hi ... Welcome to the RE/MAX Market Reports FAQ. Why and How? The Home Evaluator is a great indicator of Market changes for individual homes. Benefits Realtors can now demonstrate the previous market history and a homes price changes to better show trends to enable the home seller . buyer to make a more informed decision. This Evaluation Algorithm is based on the most accurate Home Price Index HPIp (Paired Sales analysis) for 17 cites and 114 sub areas. * The values from current to 2005 are based on using the most accurate paired sales methodology and prior to 2005 are combinations of several general HPI's and are less accurate. To Calculate Your Home Value for a Comparative Market Analysis CMA, find your; City, Home type, and Market Range. Input your previous purchase details: date and price. Final adjustments to increase accuracy: The VMR Evaluator value is based on the subject home being in the same relative condition as purchased . The #2 Real Estate Question "is this a good time to Sell or Buy? In other words is the the market going up or down? To Calculate your Home's Future Value Forecast + or -, firstly find the correct City and Home type (Single Family Detached, Condo or Townhouse). Then calculate the current value of your home by inputting it's previous purchase price and that purchase date. Now click View 2 Year Forecast to see the forecasts for your home that are based on the votes of our active Realtors. Customize Your Own Forecast: you can input Your Own Personal Forecast Annual Values for the both the Positive and Negative changes for next year and the graph will change accordingly. Final adjustments to increase accuracy: The VMR Forecaster value is based on the subject home being in the same relative condition in the future . How Accurate are the forecasts: Our Forecasting Algorithm is based on an active survey of top Realtors in the Lower Mainland. We are asking 1,000's of agents that sell the top 90% of the Real Estate to give us their opinion on the future market changes. Please vote now! I highly recommend Agents review the latest economic news and the direction of the our Canadian Finance Minister, our Bank of Canada Governor and our own Economic Forecaster from BC CREA (Links). Currently all of our Market Forecasts are based on Single Family Detached Homes. for their property in today’s Market Conditions. a Buyers or Sellers Market. Sales: How are they calculated? The Sales in the Monthly STR are calculated using the date the Sale is reported and Processed by the individual Real Estate Boards. Why this date? ...It is because the Sold Date is a Moving Number. How? ...There is a varying time lag of the Sales being reported to the Real Estate Boards, so the same Sales numbers can vary from week to week. Good Realtors monitor the Sales Activity weekly to keep apprised of Market Activity. Let’s say we count 20 sales for last week for Single Family Detached Houses within a specific Board Area and then review the Sales Activity for the whole month. Then we check that same Sales Total the following month to see the Sales numbers went up by 30% ... not good. By using the methodology in the REMAX Market Reports (although harder to collect) we get a much cleaner and accurate Sales Count. What provides the True Picture... Active or Total Monthly Listings? 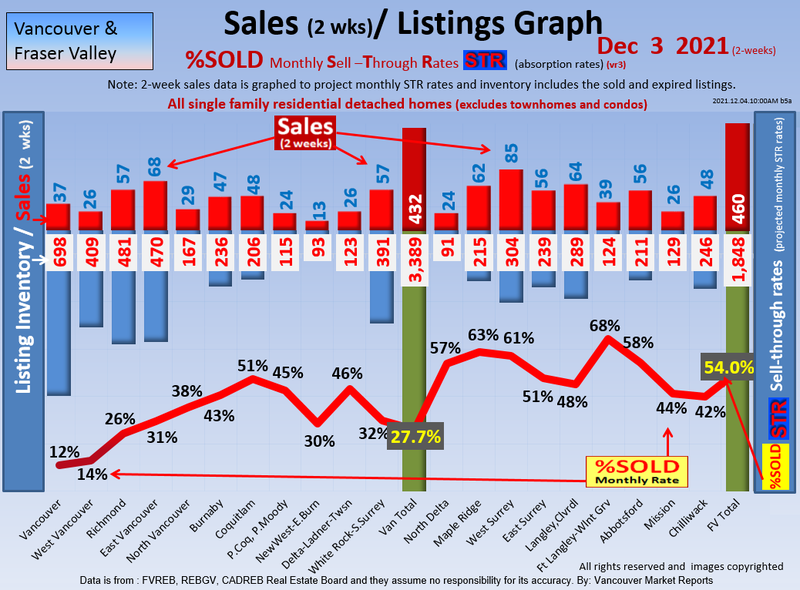 To provide the most accurate picture of Monthly Sales Activity, the REMAX Market Reports uses the Starting Monthly Inventory PLUS Newly Listed Properties for that Month PLUS The Expired Listings for that Month PLUS the Canceled and Terminated Listings to create the Total Listings marketed for that month. 15 Sales Out of 100 Total Listings Marketed for the Month= 15 %SOLD rate for the month. Does the 25 %SOLD rate mean prices will go up or down? Let me explain: In a market with a low 12 %SOLD for months where the average seller is discounting 7% from "list to sell" then they experience a jump to 25 %SOLD those sellers would immediately reduce their discounting and could even result in their homes selling for MORE than the list price.. So here we see a 7% increase in just a few weeks with 25 %SOLD rate. Then if the market is been records setting high amounts like 35 %SOLD rates and sales at $40,000 over list and then the sellers are no longer getting multiple offers and are actually coming down 3%. then at 25 %SOLD sold rate prices just drop $50-60 thousand dollars. Note: the STR %SOLD rate is always reported on a monthly rate ..;. so when looking at 2 week reports do remember that the %SOLD rate is adjusted to a 4 week rate so they are relatively consistent. eg: 2 weeks of sales over Inventory times 2.2 weeks in a month= the MONTHLY %%SOLD rate. These are the forward projections we use to assist our clients to maximize their sales price based on Increasing or Decreasing Inventory Levels. It’s a wonderful tool demonstrate to how see 1-2 months into the future. Very simply; as New Listings come on each month, we need between 39-64% of THOSE New Listings Amount to sell DURING THAT MONTH. If the ( MTI ) is LESS than 39% of that NEW Added Inventory SELLING during that same month, then the NEXT MONTH’S Total Listing Inventory will INCREASE. If the ( MTI ) is MORE than 64% of that NEW Added Inventory SELLING during that same month, then the NEXT MONTH’S Total Listing Inventory will DECREASE. If the Market Trend Index ( MTI ) is showing a clear pattern of ongoing Increasing Inventories along with Weak Sales Activity (Below 12%), we recommend to “Price Ahead of the Curve” to avoid being drawn with the masses into the probable Downward Market Trend, Get Your Property Sold, and then you can TAKE ADVANTAGE of the future Buyer Market Conditions. In a Buyer’s Market, when you have extra inventory on the market and anxious sellers you can get that BEST PROPERTY- BEST LOCATION- GREAT VALUE WIN. This is the Difference from the List Price to the Sales Price for this Month’s Sales. It is the Strongest Indicator of Market changes. Simply put, in a Seller’s Market, we see very little Discount from the List Price to the Sale Price, and in fact, often see properties Selling well in Excess of the Original List Price. In a Buyer’s Market we see quite the Reverse, which is Properties Selling for Much Less than the List Price set by the Sellers for their properties. The Sale Price in both instances is the Market Price. The Market Price is set by the Market Conditions and Buyers Confidence Level (What an Able Buyer is willing to pay a Seller in a “Arm’s Length” Transaction, at any given time). The next factor in this equation are the Monthly Price Reductions for Active Listings (which in itself is a very telling indication), where the Sellers recognize that their pricing is Above (too high) the Current Market Conditions. The RMR monitors and records both the Average and Median dollar amounts of the Price Reductions for the month, determining the movement of the Sellers (as a Whole Group) towards True Market Pricing. It is another powerful Tool to assist our Sellers to get Top Market Price. If a pattern of increasing ( SDR ) Number and Dollar Amounts of the Price Reductions continue, it signifies the Trend is towards Lower Sale Prices. The Longer the Seller takes to Respond to the Shifting Market Conditions ... the Less Money they will realize from the Sale of their property. Different Buyer Groups equal different Consumer Confidences: Local Buyers confidence are subject to elections, employment and money supply changes where as the foreign investor can be oblivious to such issues. Case in point: when the S&P downgraded the American credit rating in August 2011, we had an immediate 33% drop in sales in the West Vancouver/Vancouver/Richmond-Chinese corridor area, with virtually NO ONE receiving multiple offers in those markets. Meanwhile, in the Fraser Valley, the S&P Downgrade made a minimal difference. Previously it was February 2011, it was the Mainland Chinese Buyers that bolstered the Market Activity. In February 2012, it was it was the Local Buyers confidence fueling the Market Activity. This is why we study both Consumer Confidences to provide more accurate Buyer Activity Projections. We all remember the uncertainty caused by the Introduction and then Removal of the HST. It caused a massive drop in Consumer Confidence throughout all areas of the Economy and in general, un-necessary hardship on the Public. From a different angle, here in the Lower Mainland, we live in the Jewel of the North American West Coast, offering a temperate climate, with an Economy, Political System, Schools, and Health System, which are the envy of the rest of the World. People WANT TO LIVE HERE. New Canadians means NEW MONEY, directly entering our Local Economy. It is definitely a factor which has affected our ongoing Home Values. In July of 2012 the Banking Mortgage rules reduced the 30 year amortization from 30 years to 25 years. This tightening of credit is reputed to have reduced our qualified home purchasers by 20%. Thus we saw a substantial drop in sales over the next 6 months. Canadian manufacturing sales increased 1.7 per cent in November, following a 1.4 per cent decline in October. Sales rose in 12 of 21 manufacturing industries. Adjusting for inflation, Canadian manufacturing sales were 1.6 per cent higher in November. With the release of November's manufacturing and trade data, we estimate that the Canadian economy grew approximately 1.7 per cent in the fourth quarter of 2012. Sales in the BC Manufacturing Sector rose 1.2 per cent in November, and were 4.3 per cent higher Year-over-Year. Primary and Fabricated Metal Manufacturing, (which accounts for 13% of BC Manufacturing, was up 4.5% in November, while Forestry Products (30% of BC Manufacturing Sales) were up just under 1 per cent, and Food manufacturing (17% of BC Manufacturing Sales) was up 1 per cent. We monitor and study Economic Indicators to monitor the ongoing strength of the Canadian and BC Economies, to determine the ability of Local Buyers to purchase. ... after 14 years of emailing newsletters only ..I Bill Coughlin am now doing printed newsletters once again, because of the dramatic drop in readership due to most clients receiving a complete email overload. The printed newsletter if hand addressed is getting the highest readership!! Printing your PDF for Newsletters is real easy. Open your PDF using the free adobe PDF reader. We will email your newsletters for you..
.. are doing more office work than actually talking to clients??? GL give us your administration tasks and YOU JUST SELL HOMES / Call your clients ..... earning $500/ hour!!!! Most data is based on Medians instead of averages and the data is calculated on Processed date not Sales date. Days On Market ( DOM is calculated using the median of the all the sales. In a few cases where their are limited our usual sales eg: 5 sales and 3 of them are 3 days in 0 days, 1 at 118 days and 1 at 18 days we report the median of - days. this would be marked as limited data. Hi Bill since July about 756 RE/MAX agents have used these reports and the data in their CMA's, Price Reductions and and News Content that was sent to 10,000's of their clients and now they earned extra commissions. OK do step forward and let us help you! Today these easy to understand "All-In-One" RE/MAX Market Reports will impress your clients and make you $$$'s. 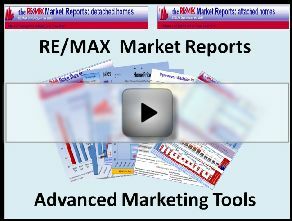 Download sample sponsored BE-ALL REMAX Market Reports here. Serving the Fraser Valley for 20+ years. Hello Bill fellow Re/Max Agent.. please enjoy and use these reports to assist you in closing that next listing.